Some laborers have quit and headed to Russia for jobs on building sites. Construction laborers on Tajikistan’s giant Roghun hydroelectric dam project have reportedly complained that they have not been paid their salaries for several months. Moscow-based news website Ferghana reported on February 11 that a group of workers have submitted a petition to local prosecutors to resolve the situation. The website anonymously cited employees at two sub-contractors as saying that they have not received pay since September. Those companies were in turn not paid by the government for their work, Ferghana quoted its sources as saying. The project is being wholly funded by the government and executed by a state-controlled company. “Private subcontractors have been compelled to spend their own funds, and some are are already declining to work with OAO Roghun GES,” the website reported. 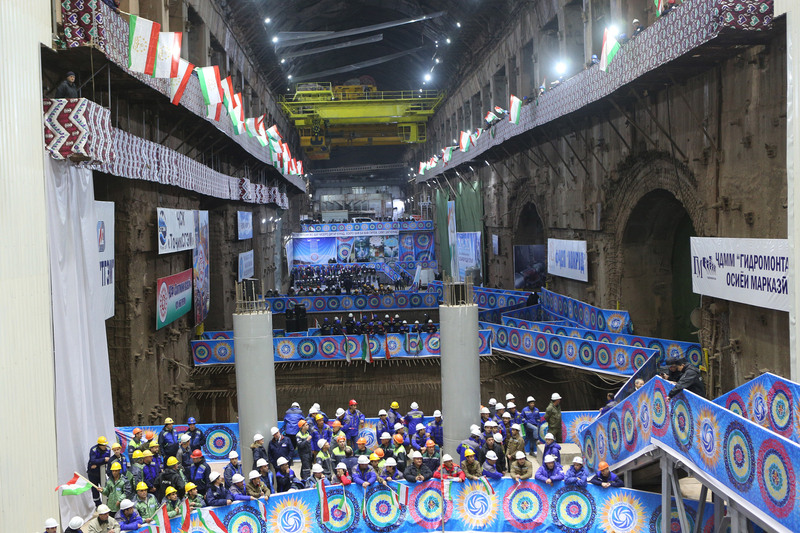 In mid-November, President Emomali Rahmon officiated over a major ceremony to set the first power-generating turbine out of the six planned for the dam into motion. Salini Impregilo, the Milan-based company that was awarded the contract to erect the 335-meter-high dam, said at the time that their schedule envisioned a second turbine producing power by 2019. It is unclear how possible payment disputes could affect that timetable. One affected company named by Ferghana is Dnepr-SGEM, the Ukrainian company assembling the turbines, whose employees have reportedly not been paid for two or three months. “Even the large Italian company Salini Impregilo, which is building the dam wall, is in a difficult position,” a manager at one sub-contractor told Ferghana on condition of anonymity. A spokesman for Salini Impregilo declined to address allegations about non-payment of salaries and said that their contract required the company to redirect all media queries to the Tajik government. State officials are not authorized, however, to grant comments to the media. Some workers have apparently quit their jobs to leave for building site jobs in Russia. Repeated petitions to the prosecutor’s office in January have gone unheeded, Ferghana reported. “The workers have already gone to the prosecutor’s office twice, but they just shrug their shoulders and refuse to give any explanation,” the website cited one source as saying. Roghun is a mammoth project that is said to employ around 20,000 laborers. If it is ever completed, the dam will tower 335 meters and become the highest of its kind ever built. Tajikistan hopes to resurrect the economy by exporting electricity to countries like Afghanistan and Pakistan. Despite those outsized ambitions, however, it is has never been very clear where Tajikistan is going to find the $4 billion or so needed to finish the project. The government has allocated $430 million toward construction for this year alone.